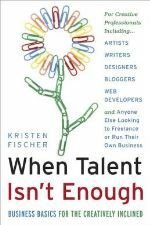 April Michelle Davis was interviewed and quoted in the book When Talent Isn’t Enough: Business Basics for the Creatively Inclined: For Creative Professionals, Including . . . Artists, Writers, Designers, Bloggers . . . to Freelance or Run Their Own Business. The author, Kristen Fischer, recognized April Michelle as a prime example of a freelancer who is building a business around her talents. As the old adage says, timing is everything. April Michelle was busy with freelance work so she and her husband determined how much money was needed to make it into a full-time profession. Together, they came up with a minimum and April Michelle has successfully obtained or exceeded it since. In addition to willingly provide candid insight into launching and managing her own business, April Michelle is sincerely interested in helping other freelancers succeed by sharing both what has worked for her and what has not worked for her. You may contact April Michelle with questions or comments. This entry was posted on Thursday, August 1st, 2013 at 12:00 pm and is filed under EI News. You can follow any responses to this entry through the RSS 2.0 feed. Responses are currently closed, but you can trackback from your own site.